Total Video Converter for Mac is a powerful video converter for Mac.The application can combine several video clips,including the same and different formats t a single video on Mac at high speed with perfect output quality. Current Page:Home > Mac Total Video Converter >How to combine various video clips to a single video on Mac ? How to combine various video clips to a single video? Do you love to take videos using your mobilphone? I have to take several clips because of the limit of my mobilephone space. And how can I do if I want to combine the video clips to a single video for Mac OS? When I take the video clips with my phone and want to convert them into MP4 ,what program should I use? This tutorial is show you how to combine video clips(MP4,AVI,MOV,MPG, etc ) to a single video on Mac OS X.
Click "Tools" button, you will get below UI, and select " Combine several videos to one file " tool. When you open the tool,you can the below window. 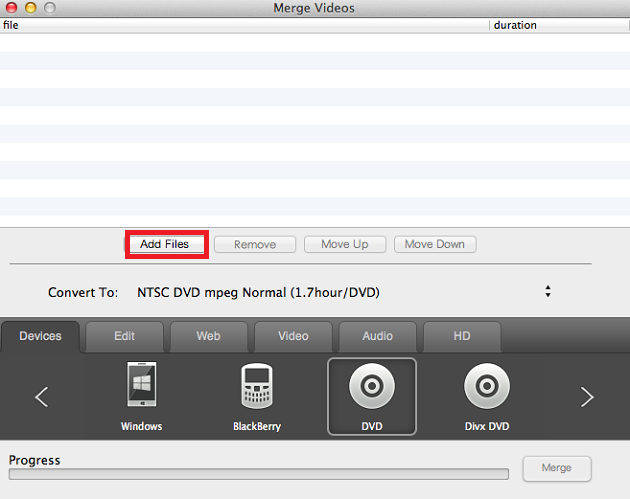 Then click "Add Files " button to import the video clips that you want to combine to a single video. When you add the video clips ,you need to select the output format that the video clips will be converted to. The last step, click the "Start" button to combine video clips to one file. A few minutes later, the destination folder will open automatically when the conversion is completed.